I’ve talked about Baen Books in passing before, but I thought I’d devote a whole post to them. Baen Books has been my favorite publisher for years. Their stable of authors has included some of my all time favorite SciFi/Fantasy authors. Mercedes Lackey, David Weber, and more recently John Ringo and others have kept me entertained for years. Baen has always been a progressive publisher, but with the rise of ebooks, they’ve catapulted into readership stardom. Check out what people are saying about them on Amazon.com…Link to Reviews. The biggest thing about Baen Books’ ebooks that push them far ahead of all other publishers, is the fact their ebooks are released DRM-free, with no restrictions on who you can lend them to, or any other encumbrance. Additionally, the ebooks cost LESS than the print version. When I look on Amazon or other publisher sites, the ebooks always cost the same or MORE than the printed version of a book I’m wanting to buy. What foolishness is this??? Ebooks are cheaper to distribute. They shouldn’t cost MORE than a book that costs much more to make! Also, Baen books pays higher royalties to authors for ebooks. That’s right, they pay MORE to an author for a book that costs LESS to produce. Of all current publishers, it appears that Baen is the only one being run by people with some common sense. I’m a devoted reader of their ebooks, and in fact I own every current Webscription month. I go to the local public library, and I still buy paper books, but every month, I pay $15, and get FOUR to SIX currently released novels. Try to do that with Del Rey, Tor, or any other publisher. Won’t happen. With their ebooks priced at around $8 (the same price as a paperback), you’ll only get two for that price. And they’ll be locked down to one device/computer, with DRM dripping from the seams. All-in-all, Baen Books is my favorite publisher, and I don’t see that changing anytime soon. I want to love the Kindle. Just as I wanted to love the Sony eReader. But when I see what’s actually come out of Amazon’s labs, I want to scream. Does anyone that designs these things actually have a real life and job? Or do they all make a million dollars a year, and read NOTHING? Every one of these “ereaders” that have hit the market the past couple of years have been long on gimmicks, and short on practicality. It seems that no one wants to design an ereader for wide adoption. Everything seems to only be designed for a niche market. It uses e-ink. 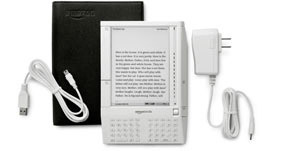 Like the Sony product, the Kindle uses e-ink (or as Amazon calls it, electronic paper). This means long battery life, and much better contrast, for a better reading experience. The best thing about e-paper is that it doesn’t use ANY power except to change the image. So you can leave the device on for hours, and it won’t use any power until you turn the page. It has built-in EVDO. This means you can download books and stuff directly to the device through the cell phone network. Well, a proprietary part of it, anyway. It has a built-in keyboard. Some may see this as a negative, but I think it’s a positive. IT’S $400! I think that’s the biggest downside. This thing is way more expensive than it should be. For widespread adoption, the price needs to fall in the $50-$100 range. $400? Only the real gadget geeks will buy it. It MAY make money, but not a lot. How can any device manufacturer hope to gain widespread use if you overprice your major markets? The only wireless is EVDO. This may be a positive, but it’s also a major negative. Amazon, not everyone lives in an urban area. Not all of us have EVDO access. Some of us don’t even have good cell phone access. Put a 802.11 g radio in there, for goodness sake! Heck, they make T-SHIRTS with 802.11 receivers in them! DRM’d up the wazoo e-books. Unreal. Only one major publisher seems to get how e-books should work. E-books should be CHEAPER than their print counterparts, due to reduced production costs. Only Baen Books gets it. And Amazon…good Lord, I don’t know what went through their heads, but it wasn’t intelligent thought. Books cost as much if not more than their print counterparts. You can’t lend them to other people. You can’t even read them on other devices. It’s ugly, with bad ergonomics. Not necessarily a deal-breaker, it’s nonetheless something to think about. This device is clunky-looking, bland, and basically looks like it was designed by someone determined that they would NEVER use it. I’m sorry, Amazon, but no matter how much I may WANT to like the Kindle, I don’t. I might have given it a chance, but the price is out of reach for me, and I abhor your DRM scheme. Thumbs down, way down. If I’m going to spend $400, it’s not going to be on a uni-tasker like the Kindle, but something more like the Nokia n800, or the soon-to-be-released n810. Now THERE’S something to spend your hard-earned salary on! A very Happy Thanksgiving to all my U.S. reader(s). I hope everyone remembers what they have to be thankful for. After all, if you’re reading this, then you are: alive, can see, can read, have access to a computer, and have access to the internet. Any one of those are cause for thanks. New theme for a new age! Ok, ok, it’s been four months since I posted. Sorry to my one reader. HA! As you can see, I’ve changed the theme. I like blue better. I’ve got some reviews coming up, as well as some other things, so stay tuned!